Seth Strong III was the son of Seth Strong Jr.
Seth Strong Jr. was born in June 1743. He was the son of Deacon Seth Strong and Lois Strong. Child of Seth Strong Jr.
[S84] Benjamin Woodbridge Dwight Elder John Strong, Volume II, Page 1276. Deacon Seth Strong was born on 4 April 1716. He was the son of Jerijah Strong and Thankful Stebbins. Deacon Seth Strong married Lois Strong, daughter of Jonathan Strong and Mehitable Stebbins, in 1740. [S84] Benjamin Woodbridge Dwight Elder John Strong, Volume II, Page 1482. Without a complete study of the records one can only surmise what the circumstances are around the marriage of Mercy to Timothy Alderman before the death of Amassa Moore. It was noted of Amassa's death that he drank "cider brandy by the pint." So perhaps she divorced him. [S178] Christina Bailey and Lorraine Cook White, Barbour: Granby, Page 117. [S104] DAR DAR Lineage book, Vol 63, Page 188, #62560. [S359] William Alderman Parker, Alderman, Page 530. Edson and Helen were enumerated in the 1860 Hartsgrove, Ashtabula Co., OH, federal census, page 139, near his father. He was listed as "E. Hocum." He was a farmer, age 28; she was 28, born in NY. Children in the household, all born in Ohio, were Adelaide 7, Lillian 5, Jeanette 3, and unnamed 7/12. Edson and Mary H. were enumerated in the 1870 Hartsgrove, Ashtabula Co., OH, federal census. He was a farmer age 37, she was 38. Children in the household were Adelade 16, Lillian 15, Jeanete 13, Eva M. 10, Victoria 8, Ally 6, and William 4. Edson and Helen were enumerated in the 1880 Hartsgrove, Ashtabula Co., OH, federal census, ED 12, page 12. Children in the household were Allie 17, Sherman 14, Leonard 8 and apparently a grand-daughter, Dalia Biglow. Edison's mother Abigail, age 83 was also in the household. Mary Helen Bulfinch was the daughter of Jonathan Bullfinch and Clarissa (?) Mary Helen Bulfinch married Edson Greenlief Holcombe, son of Caleb Holcombe and Abigail Norris, on 25 April 1852 at Hartsgrove, Ashtabula Co., OH. W. Sherman and Lucy M. were enumerated in the 1900 Plymouth, Ashtabula Co., OH, federal census. He was a farmer, age 33, she was 31. They had been married 12 years and had three children, all still living. Children in the household were Harvey E. 8, William D. 7, and Walter E. 3, all born in OH. [S593] Sue Eden, "Edson Holcombe," e-mail to James H. Holcombe, 24 March 2006. Lucy Mann was born in April 1869 at OH.1 She married William Sherman Holcombe, son of Edson Greenlief Holcombe and Mary Helen Bulfinch, on 25 December 1888. [S182] Social Security Death Index (on-line), Ancestry.com, SSDI, Ancestry.com. Ensign Joseph Phelps was born on 18 October 1716 at Turkey Hills, Hartford Co., CT. He was the son of Joseph Phelps and Rebecca North. Ensign Joseph Phelps married Deborah Holcombe, daughter of Lt. David Holcombe and Mehitable Buttolph, on 15 October 1740 at Simsbury, Hartford Co., CT.2 Ensign Joseph Phelps died on 14 May 1775 at Turkey Hills, Hartford Co., CT, at age 58. [S135] Judge Oliver Seymour Phelps Phelps Family, Vol. I:Pg. 193/Item 369. [S45] Albert C. Bates, Simsbury, Page 117. Deborah Holcombe was born on 28 September 1726 at Granby, Hartford Co., CT.2 She was the daughter of Lt. David Holcombe and Mehitable Buttolph. Deborah Holcombe married Ensign Joseph Phelps, son of Joseph Phelps and Rebecca North, on 15 October 1740 at Simsbury, Hartford Co., CT.3 Deborah Holcombe died in 1772 at Turkey Hills, Hartford Co., CT.
[S25] Hannah McPherson, Holcombe Genealogy, Page 122.2/Item A-8-1-2-3. [S25] Hannah McPherson, Holcombe Genealogy, Page 119.2. [S385] Oliver Popenoe, "Williams, William." [S807] Find A Grave, online http://www.findagrave.com, memorial ID # 84263234. Milo A. Holcombe was born on 1 August 1799. He was the son of Abraham Holcombe and Rosanna Adams. Milo A. Holcombe married Susan Jane Case on 26 August 1827 at Simsbury, Hartford Co., CT.2 Milo A. Holcombe married Catherine Duell.3 Milo A. Holcombe died on 8 December 1867 at Granby, Hartford Co., CT, at age 68; GS. Milo A. and Catherine were enumerated in the 1850 Granby, Hartford Co., CT census with 11 year old Duel. Milo A. and Catherine were enumerated in the 1860 Granby, Hartford Co., CT, census with 20 year old Deual. [S25] Hannah McPherson, Holcombe Genealogy, Page 50.2/Item A-4-5-2-3-1-7-1. [S45] Albert C. Bates, Simsbury, Page 292. [S25] Hannah McPherson, Holcombe Genealogy, Page 50.2. Susan Jane Case was born on 22 August 1808. She married Milo A. Holcombe, son of Abraham Holcombe and Rosanna Adams, on 26 August 1827 at Simsbury, Hartford Co., CT.1 Susan Jane Case died on 4 November 1833 at age 25. Addison David Case was born on 26 January 1855 at Simsbury, Hartford Co., CT. He was the son of Jason Edwin Case and Almira Dency Holcombe. Addison David Case married Katherine Lavinia Norris on 1 January 1880 at Glastonbury, Hartford Co., CT.
[S101] Ruth Cost Duncan, John Case, Page 173/Item 521. Katherine is recorded in the 1900 Glastonbury census, film T623-136, page 25A, line 2. She is divorced and Alfred, Mabel, Addison, and Myrtle are living with her. Katherine Lavinia Norris was born on 20 July 1864 at Windsor, Hartford Co., CT. She married Addison David Case, son of Jason Edwin Case and Almira Dency Holcombe, on 1 January 1880 at Glastonbury, Hartford Co., CT.
Alfred Welles Case was born on 20 February 1882 at Glastonbury, Hartford Co., CT. He was the son of Addison David Case and Katherine Lavinia Norris. Mabel Viola Case was born on 25 April 1883 at Glastonbury, Hartford Co., CT. She was the daughter of Addison David Case and Katherine Lavinia Norris. Addison David Case was born on 13 September 1884 at Glastonbury, Hartford Co., CT. He was the son of Addison David Case and Katherine Lavinia Norris. Myrtle Iona Case was born on 12 June 1890 at Glastonbury, Hartford Co., CT. She was the daughter of Addison David Case and Katherine Lavinia Norris. John Barney was born in 1785. He was the son of Commodore Joshua Barney and Ann Bedford. John Barney married Elizabeth Hindman in 1810. John Barney died in 1856. Elizabeth Hindman was born in 1792. She married John Barney, son of Commodore Joshua Barney and Ann Bedford, in 1810. Elizabeth Hindman died in 1849. Joshua was a lieutenant, captain and commodore and carried dispatches to Benjamin Franklin in France. Commodore Joshua Barney was born in 1759 at Baltimore, Baltimore Co., MD. He died in 1818 at Pittsburgh, Allegheny Co., PA.
Nannie Dornin Barney was born at Norfolk, Isle of Wight Co, VA. She was the daughter of Jospeh Nicholson Barney and Anne Seddon. Harvey Holcombe was born on 21 July 1787 at Granby, Hartford Co., CT.2,3 He was the son of Joshua P. Holcombe and Sarah Smith. Harvey Holcombe married Catherine Case.3 Harvey Holcombe married Celesta Carey on 17 October 1824.2,4 Harvey Holcombe died on 19 April 1870 at Hanover, Luzerne Co., PA, at age 82. Harvey and Celesta were enumerated in the 1850 census of Hanover, Luzerne (now York) Co., PA. He was a farmer age 62, she was 50. Children in the household were Celesta 15, Miles 12, Sarah M. 8, and Harvey 6. Son Charles was enumerated next door. Celestia and Harvey had 9 children: Charles, Caroline, Lina, Nathan, Jane, Selestia, Miles, Sarah Melissa, Harvey, Jr.
[S25] Hannah McPherson, Holcombe Genealogy, Page 45.2/Item A-4-5-2-2-1-6. [S67] 1850 Federal Census,, On-line Database, Year: 1850; Census Place: Hanover, Luzerne, Pennsylvania; Roll: M432_794; Page: 454B; Image: 154. Ancestry.com Online publication - Provo, UT, USA: Ancestry.com Operations, Inc., 2009. Images reproduced by FamilySearch.Original data - Seventh Census of the United States, 1850; (National Archives Microfilm Publication M432, 1009 rolls); Records of the Bureau of the. [S187] Committee on Publication, Connecticut Sons of the Revolution. [S807] Find A Grave, online http://www.findagrave.com, Find A Grave, database and images (https://www.findagrave.com : accessed 10 October 2018), memorial page for Celestia Cary Holcomb (8 Nov 1801–11 Feb 1862), Find A Grave Memorial no. 34705437, citing Hanover Cemetery, Hanover, Luzerne County, Pennsylvania, USA ; Maintained by Find A Grave (contributor 8) . Carlos and Adah were recorded in the 1850 New Hartford, Litchfield Co., CT, federal census. He was a farmer age 39, she was 34. Children in the household were Hiram B. 8, Carlos O. 8, and Marcus 5. [S25] Hannah McPherson, Holcombe Genealogy, Page 45.2/Item A-4-5-2-2-1-6-1. [S340] Walter Holcomb, Walter Holcombe, Page 9. Adah Lavinia Bushnell was born on 18 September 1815 at Hartland, Hartford Co., CT.1 She was the daughter of Isaac Bushnell and Orpha (?) Adah Lavinia Bushnell married Carlos Holcombe, son of Harvey Holcombe and Catherine Case, on 8 May 1838 at Hitchcoxville (now Riverton), Litchfield Co., CT.1 Adah Lavinia Bushnell died on 3 May 1904 at New Hartford, Litchfield Co., CT, at age 88.1 She was buried on 6 May 1904 at Southington, Hartford Co., CT.
Mrs. Ada L. Holcomb, widow of Carlos Holcomb, died yesterday at the home of her son, Hiram B. Holcomb in New Hartford, death being due to old age. Mrs. Holcomb, who was born September 18, 1815, is survived by four sons, Judge M.H. Holcomb of Southington, Hiram B. Holcomb of New Hartford, Walter Holcomb of Torrington and Carolos O. Holcomb of New Britain and one daughter, Mrs. Adelaide Weaver, widow of Sterrie A. Weaver of Westfield, Mass. The funeral will be held at 1 o'clock tomorrow afternoon in New Hartford. Rev. N. Wright, pastor of the Methodist Church in Pleasant Valley, officiating. The burial will be in Southington. Isaac Bushnell married Orpha (?) Isaac Bushnell was buried at Colebrook River Cemetery, New Hartford, Litchfield Co., CT.
Orpha (?) married Isaac Bushnell. Orpha (?) was buried at Colebrook River Cemetery, New Hartford, Litchfield Co., CT.
Gov. Marcus Hensey Holcombe was born on 28 November 1844 at New Hartford, Litchfield Co., CT.2,3 He was the son of Carlos Holcombe and Adah Lavinia Bushnell. Gov. Marcus Hensey Holcombe married Sarah Carpenter Bennett on 16 October 1872.2 Gov. Marcus Hensey Holcombe died on 5 March 1932 at Southington, Hartford Co., CT, at age 87.2 He was buried on 8 March 1932 at Oak Hill Cemetery, Southington, Hartford Co., CT.
Marcus Hensey Holcomb, Connecticut War Governor, and the “Uncle Marcus” of Connecticut Republicans, died at his home here this afternoon at 5:115, in his eighty-eighth year. He had been in feeble health for several months. 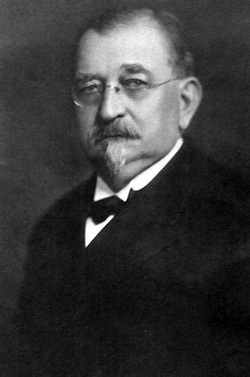 Mr. Holcomb, first nominated for Governor just before he was retired at the age of 70 from the Superior Court bench, was three times elected, serving as the State’s Chief Executive from 1915 to 1921. He had been State Senator, Speaker of the House of Representatives and Attorney General before his appointment as a judge. With the passing of Marcus H. Holcomb, Connecticut loses one of its veritable elder statesmen—a man upon whom the governorship was forced in spite of his verbal declination and a letter phrased to forestall his own nomination. Nominated while still a Superior Court judge, he made no speaking campaign, and even after his election maintained a silence upon political questions until after the age limit brought his retirement from the bench on his seventieth birthday, November 28, 1914. Born on a farm in New Hartford in 1844, a son of Charles and Ada (Bushnell) Holcomb, the future War Governor took advantage of such educational opportunities as were offered by the common schools of a Litchfield County town of 1800 people. Some private tutoring followed and later still he attended Wesleyan Academy, now Wilbraham Academy, in Wilbraham, Mass. The college course which his parents planned for him was foregone when his health broke under too close application to his studies and a sunstroke which for a time completely prostrated him. Somewhat restored in health, young Holcomb, as have so many other notable men, secured employment as a school teacher while he studied law. Judge Jared B. Foster was preceptor in the law, and his first teaching experience was gained in the combined district of Barkhamsted and Hartland, followed by work in the New Hartford school where he himself had been taught and later in Pine Meadow and Plainville. Admitted to the bar November 15, 1871, just before his twenty-seventh birthday, he removed to Hartford before the end of the year, but remained there but a brief time, coming to Southington where he established an office in 1872. He had made his home here ever since. Governor Holcomb’s father was a staunch Democrat and had held office in New Hartford as a selectman, assessor, and member of the board of relief. His son accepted the political dogma of his father in the fashion of the times. Being one of two lawyers in Southing – the other was Judge Walter S. Merrill – it was inevitable that the young attorney become active in politics. In 1873, a year after he had settled in the town, he was elected judge of probate, an unusual honor for a man less than 30 years old. He held this office for three decades, usually being nominated by both major parties and running without opposition. He was appointed town counsel and drafted the first charter of the Borough of Southington. He also served as justice of the peace, and when the town court was chartered by the Legislature, he was named as its first judge. In 1888, the future Governor changed his political faith and became a Republican. The tariff was given always by Governor Holcomb as the reason for his changing his party affiliation, as he felt his opposition to the free trade stand of the Democrats outweighed the traditional political sympathies of his youth. Shortly after, in 1893, he with the late Noble E. Pierce of Bristol, formed the law firm of Holcomb and Pierce with offices in Hartford. This partnership endured until 1910. Just before this Mr. Holcomb made his first venture into state politics, as the Republican candidate for state senator from the old Second District. He was elected, but the 1893 Senate, comprising 24 members was evenly divided between the parties, and a Democratic Lieutenant Governor, Ernest Cady, had the deciding vote, so the Senator from the Second had small opportunities to shine in committee work. In the year of his first legislative service, he was elected treasurer of Hartford County, and later was named a counsel for the county as well, holding both these positions until 1908. When a new division of senatorial districts was made in 1901, Senator Holcomb was elected a member of the Republican State Central Committee form the Fifth Senatorial District. Southington named him as a delegate to the Constitutional convention which met in 1902. His home town sent Senator Holcomb to the House of Representatives as one of its two representatives in the 1905 session, and he was elected to the Speakership of that House. As a member of the Republican organization which won two memorable contests in this session, he had his part in sending Morgan G. Bulkeley to the United States Senate to succeed General Joseph R. Hawley and in nominating Frank B. Brandegee as the Republican candidate for United States Senator. The Republican State Convention of the next year, 1906, selected Speaker Holcomb as its candidate for Attorney General in succession to William A. King of Windham, Frank E. Healy of Windsor Locks not then having established the precedent of an Attorney General succeeding himself in that office and General King’s term being held to preclude a re-nomination. Along with the rest of the ticket he was elected, receiving a plurality of 22,190, the second highest of any candidate, and running 80 votes ahead of his ticket in his hometown of Southington. As Attorney General, Holcomb brought the celebrated toll bridge actions, under a mandate of the General Assembly, freeing the Suffield-Thompsonville, Middletown-Portland, and Niantic bridges. Shortly after the beginning of the second half of his term as Attorney General, came the death of Governor George L. Lilley, the first Chief Executive of the state to die in office since the present constitution had been adopted, and one of the major opinions of Attorney General Holcomb was that advising as to the succession. This situation has since been clarified by the adoption of an amendment to the constitution. Frank B. Weeks, who succeeded to the Governorship, nominated Attorney General Holcomb to be a judge of the Superior Court and the 1909 General Assembly elected him to this post, whereupon he resigned as Attorney General to take his place, while in his sixty-fifth year, on the bench. Simeon E. Baldwin, a former Chief Justice, had been the successful Democratic candidate for Governor in 1910 and two years later, with the Republican Party split by the Progressive movement to place Theodore Roosevelt in the White House again, and as the time for the 1914 nominations approached, the name of Judge Holcomb was mentioned frequently in connection with the gubernatorial nomination. At the same time, the knowledge that Judge Holcomb would reach the retirement age of 70 on November 28, 1914, when he appeared at the height of his usefulness, led to formation of a considerable sentiment for raising the retirement age for judges. This change, however, has never materialized. Through that summer, there was increasing talk of Holcomb for Governor, but the judge declined to discuss politics while he was on the bench, although making it clear that he would not resign his judgeship to accept a nomination or to make a campaign. It is told that for some time prior to the convention, Judge Holcomb sought audience with State Chairman J. Henry Roraback to inform the state leader that he must not be nominated. In the forenoon of the opening day of the convention, Judge Holcomb finally secured the desired meeting, stated his position, and was told by Mr. Rornback that his stand was just what had been expected. Mr. Rorabgack suggested that Judge Holcomb wait the result of the convention. Judge Holcomb was not content with the situation as it stood and he gave to John T. Robinson, a delegate from Hartford, a letter stating his position. The letter, as Mr. Robinson recalls, was not an out and out declination of the nomination, but its tone was such that had it been read, the convention would not have nominated Judge Holcomb. It was the wish of Judge Holcomb that this letter be read before the convention voted on candidates. The Republican convention that year was in New Haven, and hardly had the second day’s session settled down to the business of selecting a state ticket when General Keeney was on his feet with a motion that the convention proceed at once to an informal ballot, without speeches. This effectively shut out the reading of the Holcomb letter, although as a matter of fact Mr. Robinson had left the missive in his hotel room. The informal ballot showed a majority for Holcomb and the vote was at once made formal and unanimous. Mr. Robinson, who had secured the word of Judge Holcomb that he would accept the nomination if it came to him, never has revealed the text of the letter, but he served as chairman of the committee to notify the candidate and received his acceptance. Then began a campaign which had features unlike those of any other, at least in the recent history of the state. Judge Holcomb accepted the nomination and there the campaign ended, as far as he was concerned. Governor Baldwin had been nominated by the Democrats as their candidate for United States Senator in opposition to Frank B. Brandegee in the first popular election of United States Senators, and Lieutenant Governor Lyman Tingler had been nominated by the Democrats for Governor. No one knew how many of the 1912 Progressives would return to the Republican ticket. Some of them had sworn they were through with the Grand Old Party forever. Election Day came, and the returns showed that Judge Holcomb was the most popular candidate on either ticket. It was apparent that his candidacy had brought the hoped-for result of returning the bolters of 1012, in large numbers to the party ranks. Despite his endorsement by the majority, however, Judge Holcomb still declined to make statements, maintaining that until his retirement from the bench on November 28, it was incumbent upon him as a judge to keep out of politics. The presidential year of 1916 arrived, with Woodrow Wilson a candidate on the slogan “He kept us out of War,” and considerable uncertainty regarding the result in Connecticut, Governor Holcomb desired to retire, but the insistence of his admirers resulted in his re-nomination after five hours of balloting in the convention and reelection. Again in 1918, Governor Holcomb wished to retire, but was persuaded to accept another nomination. There ensued one of the most bitterly fought State campaigns the State has ever seen, climaxed by the call of Woodrow Wilson for a Democratic Congress. The vote was smaller than usual, and the majorities were reduced, but the Republican ticket was elected and Governor Holcomb was returned to the executive office for the third time in succession, breaking all records since the time of the Civil War Governor, William A. Buckingham, who served from 1858 to 1866. Under his leadership, Connecticut fulfilled its important part in the conduct of the war, and again won for itself the sobriquet of the “Arsenal of the Nation.” The Home Guard was organized to replace the National Guard which had been federalized and made a part of the national forces; the State Council of Defense was organized and functioned effectively throughout the conflict. Connecticut, at the instigation of Governor Holcomb, took a complete inventory of its war strength, the so-called military census, being the first, and, it is believed, the only State, where such a canvas was made. Two amendments to the Federal Constitution were submitted to the states during the third term of Governor Holcomb, the Eighteenth Amendment, for prohibition, and the Nineteenth, giving the suffrage to women. The Eighteenth Amendment was received just after the adjournment of the legislature, and every effort was made to have the Governor convene the Legislature in special session to have this State ratify it. The Governor, with the prestige of his legal service, declared the State Constitution provided for special sessions only in emergencies, and ratifying the prohibition amendment, in his opinion, was not in that category. Connecticut, incidentally, never has ratified this amendment. In the next year, 1920, the woman suffrage amendment was pending and the country was going through the hectic fight on the League of Nations. Here in Connecticut, United States Senator Frank L. Brandegee, a leader of the anti-League group in the Senate, and an opponent of woman suffrage, was a candidate for re-election, and the campaign early reached a fever heat which was sustained through Election Day. Early in the summer the ratification of the suffrage amendment by the necessary 36 states seemed questionable, and this time it was the suffragist organization which pleaded with the Governor for a special session to bring ratification by Connecticut. Governor Holcomb again refused to see any emergency. Then Tennessee ratified the Nineteenth Amendment, making a total of 36 States which had approved. Election officials in Connecticut were faced with the prospect of the greatest number of applicants to be made voters in the history of the State, and the ordinary machinery seemed certain to prove inadequate. This the Governor deemed to be an emergency, and he called upon the 1919 Legislature to meet in special session for changing the election laws as they pertained to making voters. Between the time the session was called and the date it convened, the Tennessee ratification was questioned, and the effectiveness of the suffrage amendment was in doubt. Governor Holcomb took a firm stand that a special session of the Legislature was limited in its business to enactments concerning the emergency which called it into being, but the suffrage proponents determined to secure ratification of the amendment. The special session met, and Governor Holcomb surprised its members by making a part of his message a proclamation calling another special session for the specific purpose of ratifying the amendment. Ratification of the Nineteenth Amendment was voted, nevertheless, by the first special session, but the Governor refused to certify this vote to Washington, holding the Legislature had exceeded its power by going beyond the provisions of the call. With the ratification of the amendment again in the second special session, a foregone conclusion, the issue was not joined on this. While public opinion has inclined to give first rank to the accomplishments of Governor Holcomb in so reforming the financial policy of the state that a steadily mounting deficit was changed into a growing sinking fund, and in his leadership of the state immediately before the World War, during that conflict, and in the firs two years of readjustment, the Governor himself attached the utmost importance to his appointments to the judiciary. He often made the assertion that he cared nothing for the popular reaction to a judgeship appointment as long as the bar was satisfied. Nearly a decade after his retirement from the governorship, intimates who visited the ex-Governor at his home in Southington found these appointments one of his favorite topics of conversation. Among those appointed to the Superior Court by Governor Holcomb was William M. Maltbie, who, at the time of his appointment, was executive secretary, and who is not Chief Justice. After his retirement as Executive, Governor Holcomb took up the active work of a State referee which he had become automatically upon his retirement as a Superior Court judge more than six years before. But a short time after he left the Capitol, he was called upon to straighten the tangled affairs of the Shelton Trust Company, and the manner in which he did this, paying dollar for dollar, has become another outstanding achievement of a career which has had far more than the normal quota of striking accomplishments. Although no longer to be considered for elective office, the ex-Governor by no means retired from political life. Southington made it a practice to name him as the first member of the town’s delegation to Republican State Conventions, and a statement he issued in the preconvention campaign of 1926, supporting the candidacy of John M. Wadhams for nomination as Lieutenant Governor received a degree of attention which indicated that the former Governor was still no inconsiderable figure in state politics. Ex-Governor Holcomb voted for Wadhams in the 1926 convention when the nomination went to J. Edwin Brainard, and in 1928, he voted for William H. Blodgett, unsuccessful candidate for the United States Senatorial nomination, and for Francis A. Pallotti who failed to win the nomination for Lieutenant Governor. There is perhaps no better index to the character of the man than the fact that despite his casting his lot n these occasions with the minority in the hard world of politics where only the winner gets attention, he was still the grand old man of the party – Uncle Marcus. Mr. Holcomb’s death came through the weight of years, following marked evidences of increasing weakness through the winter months. Doctors said there were no organic troubles, It was merely that age was exerting itself. With him at the end were his brother, State’s Attorney Walter Holcomb, of Litchfield, his sister, Mrs. Sterrie A. Weaver of Westfield, Mass., who had made her winter home here in recent years, the nurses and doctors. Mr. Holcomb leaves beside his brother and sister three nieces, Bessie M. Weaver of Westfield, Mrs. Frederick H. Hill of New Britain, and Mrs. David S. Roberts of Cranford, N.J., and one nephew Attorney Carlos S., Holcomb of Manchester. He also leaves three grand nieces, Adah Grace Roberts, and Marcia Holcomb Roberts of Cranford, and Lilla Mae Hill of New Britain, and a grand nephew, David Stewart Roberts, Jr., of Cranford. Members of the family said funeral arrangements would be announced later. The former Governor was a Baptist, a thirty-second degree Mason, member of Friendship Lodge, A.F. & A.M., of Southington and the Knights Templar Commandery of Meriden. He held memberships also in the Hartford Club, the Southington Club, Meriden Lodge of Elks and Union Grange of Southington. He was married October 15, 1872, to Sarah c. Bennett of Providence, R.I. She died December 1, 1901. In business life Mr. Holcomb was for 38 years president of the Southington Savings Bank, holding that office until his death. He was a director of the Southington Bank & Trust Company and the National Fire Insurance Company of Hartford. He recently had resigned as a director of the Peck, Stow & Wilcox Company of Southington after holding the office for many years. Mr. Holcomb attended a meeting of the Southington Bank directors two weeks ago. Marcus was enumerated in the 1920 Southington, Hartford Co., CT, federal census. He was widowed, age 75; sister Adaline was living with him. Marcus was again enumerated in the 1930 Southington, federal census. He was widowed, age 86; sister Adaline was living with him. Holcomb's former home at 76 Main St., on the Green in downtown Southington, still stands. It is at present the site of the Southington Masonic Temple. The Holcomb School on Main Street in Southington was named in his honor when it opened in 1926. At the time it was the town's largest grammar school. It closed to students in 1974 and was converted into the headquarters of the town's police department in 1981. The building was razed in 2004. [S25] Hannah McPherson, Holcombe Genealogy, Page 46.1/Item A-4-5-2-2-1-6-1-4. [S340] Walter Holcomb, Walter Holcombe, Page 10. Marcus Hensey Holcombe Jr. was the son of Gov. 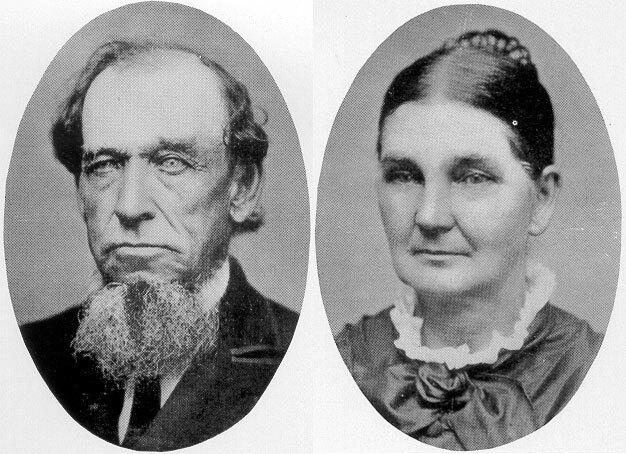 Marcus Hensey Holcombe and Sarah Carpenter Bennett. Marcus Hensey Holcombe Jr. died young. Harvey Holcombe was born on 19 March 1839 at New Hartford, Litchfield Co., CT.1 He was the son of Carlos Holcombe and Adah Lavinia Bushnell. Harvey Holcombe died on 13 October 1839 at New Hartford, Litchfield Co., CT.1 He was buried at Colebrook River Cemetery, New Hartford, Litchfield Co., CT.
Hiram Brazillia Holcombe was born on 30 July 1840 at New Boston, Berkshire Co., MA.2 He was the son of Carlos Holcombe and Adah Lavinia Bushnell. Hiram Brazillia Holcombe married Louisa Fancher on 16 June 1860.3 Hiram Brazillia Holcombe died on 8 February 1920 at New Hartford, Litchfield Co., CT, at age 79.3 He was buried at Pleasant Valley Cemetery, Barkhamsted, Litchfield Co., CT.
A farmer, New Boston, Berkshire Co., MA, and New Hartford, Litchfield Co., CT.
Hiram and Julia L. were enumerated in the 1900 New Hartford, Litchfield Co., CT, federal census. He was a house painter, age 59, she was 57. They had never had any children. [S25] Hannah McPherson, Holcombe Genealogy, Page 45.2/Item A-4-5-2-2-1-6-1-2.